The Mahindra XUV 700 is going to launch in India during the first week of October 2018. Its imminent launch brings SsangYong Rexton prices down by INR 9.5 lakhs. If you have been wanting to buy a premium full-sized SUV, this might just be the right time for you! As you must be aware, Mahindra is soon going to launch a new premium SUV, codenamed as the Y400 and likely to be called the XUV 700, in India during the month of October this year. This new premium SUV is effectively going to replace the current spec SsangYong Rexton as it is based on the 2018 iteration of the aforementioned product. That said, Mahindra dealerships still have a considerable amount of stock of the old SsangYong Rexton. Now, ahead of the launch of the Mahindra XUV 700, these dealerships have to clear this unsold stock and make way for the new product. 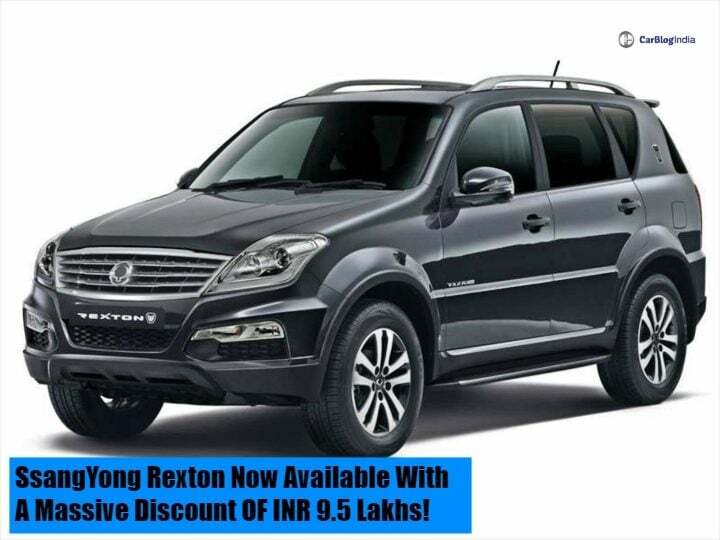 In order to achieve this, Mahindra dealerships are offering a staggering discount of INR 9.5 lakhs on the unsold stock of the Old SsangYong Rexton. What did this SUV cost in the first place without this discount? The original listed ex-showroom price of the current SsangYong Rexton is 25.99 Lakhs. And how much does the SUV now cost with the INR 9.5 Lakhs discount? With the discount, the Rexton is currently available for an ex-showroom price of INR 16.5 lakhs. This effectively converts its on-road price to INR 20 Lakhs. But even with the massive discount, does buying a product which is at the end of its life-cycle makes sense? Well, if you consider what you get as a whole package, it might! The current generation SsangYong Rexton is full-sized SUV with proper off-roading credentials. It offers a dominating presence on the road and in addition to this, is quite feature loaded as well. It is available in two variants, the RX6 and the RX7. Both the variants are powered by a 2.7-litre diesel engine. In the RX6 guise, it pumps out 162 BHP along with 340 NM of peak torque. While in the RX7 guise it pumps out 184 BHP along with 402 NM of peak torque. The former comes with a 5-speed manual gearbox while the latter gets a 5-speed AMT unit. This SUV is no slouch when it comes to offering the right creature comforts and features! Not only this, but the Rexton offers a decent amount of safety kit as standard.